Beautifully engraved specimen from the American Foreign Securities Company dated 1916. 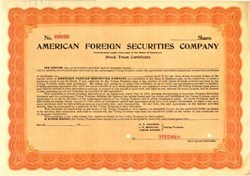 This historic document was printed by American Bank Note Company and has the company's name on top center. This item lists H.P. Davison, J. P. Morgan and James Brown as Voting Trustees and is over 100 years old. This is the first time we have had this for sale and we only have one. Clarence Dillon was a director of American Foreign Securities Corporation, which he had set up in 1915 to finance the French Government's purchases of munitions in the United States during WWI. In July, 1916 the French secured loans of $100,000,000 through the company to help fund their war effort against Germany.